Mention going camping and JavaGirl will inevitably ask, “Will there be s’mores?” The two are inextricably intertwined in her mind and I fear the day when she encounters a camping trip without that marvelous, gooey treat. The disappointment is sure to involve tears brimming in her big, brown eyes while trying to put on a brave face — a look so pitiful that it breaks the heart of any grown man within a 50-foot radius. Her association is not unique. I, too, can’t imagine a campfire without s’mores. In fact, I love all campfire cooking. S’mores were essentially the gateway to teaching me all about the joys of harnessing the raw power of fire to produce cooked food out in the wilderness. Don’t get me wrong. I covet my air conditioning and California King pillowtop bed as much as the next girl, but I appreciate how empowering camping feels and I am dismayed at how often I see families shy away from it. Both JavaKids are in scouts and when their organizations have family camping trips, I’m astonished and disheartened by the number of families who choose to come for the day and not stay overnight. We switched JavaGirl from one troop to another and one deciding factor was an insistence of one of the organizer that camping trips be catered. What?! and most importantly — you don’t need electronic gadgets to have a good time and nothing is as beautiful as a starry sky on a cloudless night when you are far away from city lights. As parents, we hear so much about self-esteem. We are bombarded with media reports with interviews of “experts” telling us what we should be doing to build up our kids’ self-esteem, what tears it down. What causes bullies, what is media doing to this generation’s self-esteem? Are we eating dinner together enough as a family? Are they watching the right shows, the wrong shows? In the right sports? Are we praising them correctly? And then we refuse to spend a night outdoors with them? And teach them some basic life skills? Really? It may not seem like much, but give a kid a stick and a marshmallow and watch his face. Why is he so delighted? Do you think it is really just the sugary snack? I mean, yes, I think s’mores are a slice of heaven — the honey-crunchy goodness of the graham cracker and just-right softly melted chocolate with the ooey-gooey marshmallow. Pure bliss! But what your kid is thinking is, “My mom just handed me something pointy! And she is letting me step next to a FIRE! And wow, I can transform this marshmallow! COOL!” Watch how your kid experiments with the different ways to cook the marshmallow — holding it close to the fire, further away from the fire, actually setting it on fire. Call it science if you want to (and indeed, it is!) But part of it is also esteem-building. A sense of control. No, the cavemen didn’t have s’mores, but imagine how they felt, experimenting with fire. When I’m in charge of the s’mores supplies (and I usually am, because I don’t want to disappoint JavaGirl!) I like to mix things up a bit and prepare a s’mores buffet. For the last camping trip, I brought chocolate marshmallows, jumbo marshmallows as well as the standard ones. I provided chocolate graham crackers and the usual honey ones. Because kids often dive into s’mores like locusts on a fresh crop, I like to prepare plates with the crackers already broken into half (s’mores sized — although now you can also buy some already in squares), the marshmallows in bowls, and the chocolates already portioned in bowls. A trick I’ve learned is that you can also use the snack-sized Hershey’s chocolate bars rather than breaking the large ones — I go with whatever is the best price at the time. We have amassed a collection of telescoping campfire forks over the years. It began with our wedding registry when I saw some for the first time at Crate & Barrel and just had to have them. People thought we were crazy and they were one of our most remarked-upon registry items (but we received them!) Since then, we’ve managed to acquire more and now bring extras with us to every camping event. For some reason, this “civilized” way of making s’mores appeals to the non-campers and we’ve noticed that the adults are willing to jump in on the s’mores making if handed a telescoping fork. When everyone is nestled into their seats, munching on their s’mores, I try to engage them in conversation about other campfire foods. Banana boats, hobo hamburgers, hobo omlettes. Recently I’ve acquired some pie irons and am itching to make some mountain pies. My kids started with s’mores, but have now learned to cook other foods as well. It was the food that lured JavaGirl into being willing to try camping even though she wasn’t sure if she wanted to stay in a tent overnight. And now she’s a tent-sleeping, frog-catching, s’mores-cooking camper, just like her brother. Looking forward to the day when she’ll get her own pocketknife so she can try her hand at whittling like he does. 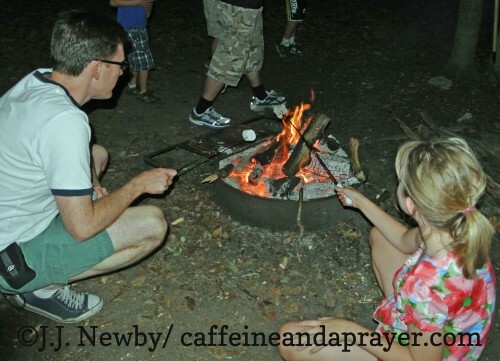 It is my hope that by getting other families to see that campfire cooking is fun, they will then be willing to give up a night of air-conditioning to try out sleeping in a tent and discover what else camping has to offer. Frankly, s’mores are the universal lures of campfire cooking — not everyone likes hot dogs! Yes, we can make s’mores on forks or in foil packets on the grill. We have an indoor s’mores maker with a sterno pot. Now you can even make them in the microwave. But there’s something to be said about instilling the love of the old-fashioned way – around a campfire with your friends, just before retiring to your tent filled with the memories of a day spent outdoors and the confidence that can only be gained by doing things yourself and knowing that if you ever really did have to rely only on yourself, you could. Disclosure: National S’mores Day was Friday, August 10. But who needs a special day to enjoy this awesome treat? My kids’ first experience with s’mores was not on a camping trip, though I highly reccommend that if you can! Find a time this summer or fall to spend some time outdoors with your family around a campfire roasting some marshmallows. 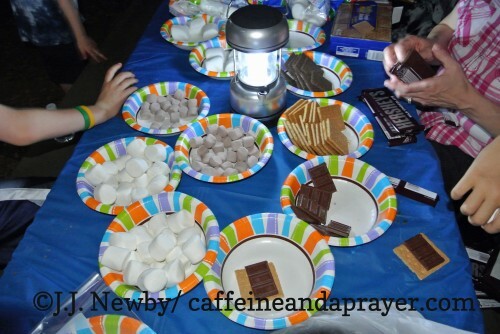 I had the pleasure of riding the Hershey’s #CampBondfire sponsored bus home from BlogHer ’12, which inspired this post. Hershey’s and Walmart provided me with a ride home from BlogHer, two scrumptious s’mores kits, and some “welcome home” goodies from Walmart. Toothless takes flight in How to Train Your Dragon Live. Photo Credit: Lisa Tomasetti. This 25% off promo code is good for weekday (including Friday) performances of select seats of the production How to Train Your Dragon Live Spectacular in all cities. See the end of the post for more details. One of my favorite parts of being a parent is watching my children and waiting for that eye-widening moment of wonder and astonishment as they experience something for the first time. It’s that moment I can’t wait for when we attend the July 19 show of How to Train Your Dragon Live Spectacular at the Verizon Center in Washington, DC. I’m already giddy just looking at the photos and videos of the show, I can only imagine their reactions to the enormous, free-roaming animatronic dragons as well as watching Toothless take flight right before their very eyes. How to Train Your Dragon Live Spectacular represents the combined effors of DreamWorks Animation, producers of the Academy Award®-nominated film, How to Train Your Dragon, and Global Creatures, the masterminds behind the international phenomenon Walking with Dinosaurs, the number one grossing world tour of 2010. Based on the book by Cressida Cowell, it focuses on a Viking teen (Hiccup) struggling with his tribe’s tradition of heroic dragon slaying, and the conflict that ensues when he encounters a dragon who challenges all he thought he knew about dragons.How To Train Your Dragon Live Spectacular immerses the audience in the story with bigger-than-life fire-breathing state-of-the-art animatronic dragons interacting with actors and trained acrobats in a full-arena live performance. These dragons are massive — the official promotional video clip is gorgeous, but I think the NBC Today Show interview gives you a much better feel for the size of the dragons in comparison to people as well as how they will “behave” — it may be a good way to prepare your children for the show. 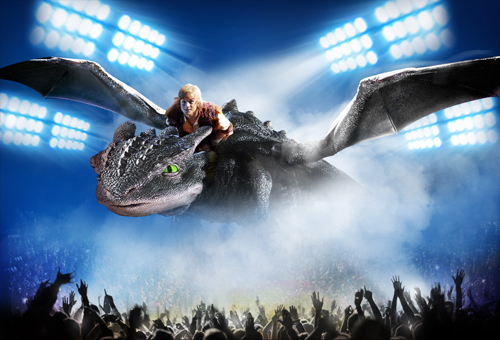 You can further enhance the experience with VIP packages that include a Hero’s Welcome from Hiccup and Astrid, backstage tours to meet the dragons and more. Note that the coupon code is not valid for the VIP packages. How to Train Your Dragon Live Spectacular will be at the Verizon Center in Washington, DC July 19-22. Regular ticket prices range from a low of $29.50 to a high of $69.50 (excluding fees). A limited number of premium seats and special VIP ticket experiences and family packages are also available. See www.dreamworksdragonslive.com for details on tickets and times. Promo code information is below. There is currently a Living Social deal for 50% off that runs until the 11th, this information is for the DC area only. Purchase your tickets online and enter the promo code MOM in the “Mom blogs” promo box. If you are buying tickets for an area other than DC and do not see the “mom blogs” promo box, I have been told that you can enter the code in the general promo box. Please note that not all cities have put their tickets on sale yet. This promo code is good for a 25% off discount on select seats for WEEKDAY (including Friday) shows. See a baby dragon and his Viking trainer at the Gaylord National Resort Saturday, July 7! Kids and their families are invited to a free live performance featuring a seven-foot-tall, 14-foot-long, smoke-breathing Baby Dragon and his brave trainer as they take kids on a magical and humorous journey to learn how to train a dragon. Kids will learn the three important lessons every young dragon trainer should know and will become an “Official Dragon Trainer” for the day. Kids will also receive a special coupon valid for discounted tickets to the DreamWorks’ How to Train Your Dragon Live Spectacular show at the Verizon Center. The Dragon will join the other DreamWorks characters (Shrek, Kung Fun Panda, etc.) as they march thru Gaylord’s Atrium interacting with guests. The Baby Dragon and his Viking Trainer will give a live, 15-minute performance that features many fun, interactive moments with the kids in the audience. Afterwards, stick around to enjoy a summertime tradition at Gaylord National – fireworks every Saturday night over the Potomac River. The best view is along the waterfront! THE MOST TECHNICALLY ADVANCED TOUR INTEGRATING ANIMATRONICS, PROJECTIONS, LIVE CAST AND NEW TECHNOLOGIES. Global Creatures & DreamWorks have partnered to bring the Academy-Award® nominated film to life with real flying, fire-breathing dragons. The production is four years in the making. The production has the largest number of animatronics ever to tour the globe. The Red Death Dragon is the largest animatronic ever built by Creature Technology Company at over 40 feet high and 60 feet wide. HOW TO TRAIN YOUR DRAGON LIVE SPECTACULAR IS THE LARGEST FAMILY TOUR EVER PRODUCED! Travels in over 30 18-Wheeler Trucks (52’ each) with a touring cast & crew of 85. Together the show weighs over 200,000 pounds. It would take one person over a year to load in the production. Takes over 160 people to set up the production in each city (the equivalent of one person working 24 hours over 70 days). If all the cables in the production were laid out end to end, they would stretch from Los Angeles to New York City. DRAGONS TAKE TO THE SKY WITH GROUND-BREAKING TECHNOLOGY! The production created the first-ever touring flight track system that weighs over 28 tons. The flight track uses a proprietary barcode system. The creatures scan a barcode strip as they fly around the track which tells them (and us) where they are at all times. Toothless weighs over 7,500 pounds and flies over 1.2 miles throughout the performance which is equivalent to a Range Rover soaring through the arena. There are more automation cues in the opening sequence alone than a Broadway musical has in a night. The first-ever fully immersive live experience with projection spanning more than 20,000 square feet throughout the entire arena. The back projection wall is equivalent to 9 movie screens combined. THE DRAGON FACTS & FIGURES. Produced over a two-year period in Melbourne, Australia. 12 different dragon species represented. Dragon wings span up to 46 feet. Each large dragon weighs over 2.6 tons (the size of a family car). Over 2 miles of “dragon skin” was created. HOW TO TRAIN YOUR DRAGON LIVE SPECTACULAR FOLLOWS ON THE HEELS OF THE HUGE SUCCESS OF WALKING WITH DINOSAURS! Before “Walking With Dinosaurs,” no free-roaming animatronics of this scale existed. Creature Technology Company has become a world leader in animatronic technology. “Walking With Dinosaurs” was #1 in Worldwide Ticket Sales in 2010, ahead of Bon Jovi, AC/ DC and Black Eyed Peas with over 6.5 million tickets sold worldwide to date. Disclosure: My family has been provided with complimentary tickets in order to review the performance. I am thrilled that the PR company has chosen to reach out to local bloggers to share a promo code so families may save money on special performances. Remember this code is for certain seats so purchase your tickets early, and put “MOM” in the “mom blogs” promo box. If you could prevent a child’s death would you? Of course you would. Picture all the children who enter kindergarten in the US each year and then imagine half of them being dead by the end of the year from preventable diseases. That’s the number of children in developing countries who are lost each year, all for the want of some simple vaccines. (Statistics in this post are provided by the United Nations Foundation). One in five children around the world does not have access to the vaccines they need to survive, which means that a child dies every 20 seconds in developing countries of a disease that can be prevented by a vaccine. This does not have to happen. There is a very simple solution. 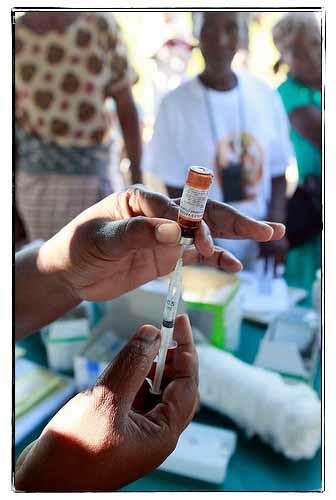 $20 can provide a lifetime of life-saving vaccines for a child in a developing country. The United Nations Foundation with many partners, has a program called Shot@Life focused on global health for children, currently by providing vaccines against four preventable diseases: polio, measles, diarrhea and pneumonia. Every child deserves a shot at life. Every child should be able to reach the milestones we look forward to our own children reaching. His first smile. Her first bike ride. His first time reading a book out loud all by himself. Her first cartwheel. Knowing the facts, can we turn a blind eye? We can’t. I learned about Shot@Life by attending a press event Friday evening, hosted by Monica Sakala of Wired Momma and Anastasia and Gianluigi Dellaccio, owners of the local business Dolci Gelati. They are ambassadors for the program and shared their stories about why they have become involved. And while the event itself was lighthearted and fun, the seriousness of the campaign was not lost on any of us who were there. Children are dying. And we can stop it. But we have to get the word out about how simple this solution is. 70% of all unvaccinated children live in just 10 developing countries. The Measles Initiative, which vaccinated one billion children in 60 developing countries since 2001, decreased world measles deaths by 78%. Polio eradication is within reach — the world is 99% polio-free, but getting that final 1% is critical. Educate yourself further about the need and the program at the Shot@Life site. Tweet about the program or World Immunization Week using the hashtags #shotatlifedc and #vaccineswork. Feel free to give a shout out to @shotatlife and to me as well @caffandaprayer. Don’t know what to say? You can always tweet this post using the short link http://caffeineandaprayer.com/?p=3232 with the hash tags #shotatlifedc and #vaccineswork. 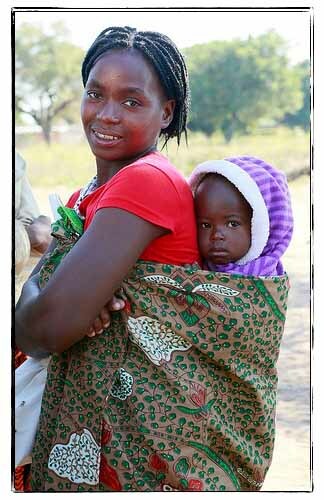 Keep current on the campaign by following @ShotatLife on Twitter and Liking them on Facebook. Sign the pledge on their web site. Put your money where your mouth is and donate whatever you can to the cause – remember, $20 can provide a lifetime of vaccines to a child. Share, share, share the info any way you can, from old-fashioned word-of-mouth to your personal Facebook pages, to even offering to host your own informational night about Shot@Life. Very rarely can we actually make a global difference right from our living rooms, but this time, we can. Let’s do it! Disclosure: I attended a press event with other bloggers and members of the media and was provided a PR gift bag. I have not been compensated for this post and everything is from my heart. I believe in this campaign. All statistics cited have been provided by the Shot@Life media kit. All photos are provided by and copyrighted by Shot@Life . No, I’m not talking about that. Commence pained look from JavaDad. Okay, I understand his perspective — he’s tired, he’s almost done eating dinner, it’s raining. He doesn’t like rapid change. It wasn’t previously discussed. We were losing daylight fast, there was no time for debate. It was either hop in the car in the next five minutes, or the opportunity was lost. Forever. There would be no do-overs. I offered him an out — something like, “You can stay here if you want, but I’m taking the kids and we’re going!” With a chirpy voice and a slight frown on my face. Simultaneously being supportive of the fact that he can be a stick-in-the-mud while subtly reminding him that it was this unique brand of craziness that he claims to have fallen in love with way before he had a driver’s license. Did I mention I was in my pajamas? My bright red pajamas with hearts on them and phrases like “Be Mine” and “KissKissKiss” all across the legs. Not 20 minutes earlier my sinus infection was making me miserable and uncharacteristically ready to snuggle under a blanket and call it a night. Usually I am up until well past midnight, but tonight, I was toast. Thus, the pajamas. I told the kids to throw on some jackets, grab their shoes and get in the car. I threw on a red fleece and figured that I’d throw caution to the wind and just go in my PJs. After all, we were just going to pull over on the side of the road in the rain — who would ever know I was in my PJs? 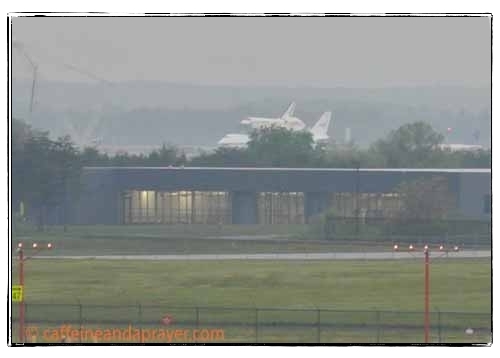 We’ve never watched planes at Dulles (IAD) from the road before. We’ve certainly done it from the observation tower at Udvar-Hazy, so I guess we never had a reason to do so from the road. We were surprised not to find a true observation point like most airports have. But we found a narrow shoulder and indeed, saw Discovery, still strapped to the jet. JavaGirl was unhappy with her vantage point from the backseat on the passenger’s side, so she and JavaDad finally decided to get out of the car and JavaBoy joined them, which prompted me to hop out so I could get a photo of them. Just then, a minivan pulled behind us and the driver enthusiastically waved at us. Oh no, surely I am not standing here, on the side of the road in my bright red pajamas and someone who knows me has pulled up?! Oh yes, not only that, but my friend K. from the Junior League. Now I’ll admit that shamefully, I often show up at school pickup in my “schlumpy mom” look — no makeup, shorts, flip-flops, ponytail or my hair looking a bit flyaway. I shouldn’t, but on those days when the most exciting thing I’m doing is laundry, the grocery store, or writing, I often focus on getting the tasks done in the window between the first and last rings of the school bell more than my appearance, but when it came to my time at the League, I tried to at least pull it together and appear decent most of the time. And I certainly don’t appear in public in my pajamas even on my worst days! Fortunately, K. had a big laugh over it. In fact, she said some other friends of hers was debating coming but were worried because their kids were in pajamas and moments later, said friends called on the phone to get directions to our vantage point. They showed up, pulling up in their minivan, parking in front of us. Why not, let’s have a party! Everyone there, you know, with me, in my bright red pajamas… They weren’t even my CUTE pajamas. Or my satin ones. I have special pajamas for when I travel to conventions and have to share a room with female friends and want to appear somewhat presentable. Nooo, couldn’t have been THOSE pajamas. So K.’s friends were polite but I think were slightly suspicious of this grown woman in red pajamas with hearts. (They are Valentine’s Day pajamas, for goodness’ sakes, they weren’t even the appropriate season! Note to self: Buy some Space Shuttle pajamas.) I tried to redeem myself by sharing our binoculars with them. 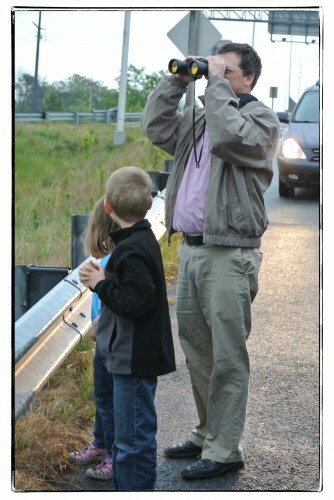 We swapped space shuttle sighting stories while my children became inexplicably ill-behaved in my SUV. And then when we all decided it was time to pack it all in, K. went to her minivan to find her battery dead. JavaDad once again shot me a slightly pained look. The Iwasjusttryingtoeatmydinnerwhathavochaveyouwroughtnow look. As we were now wedged between K.’s minivan and her friends’ minivan, we needed to pull out, do a highly illegal but unavoidable three-point turn on the one-way highway exit, and position our SUV so it would face her minivan so we the cables would reach in order to jump K.’s battery. Then, both JavaDad and the husband from the other couple bravely admitted to each other they didn’t remember exactly how to jump a battery and wisely allowed me to look up the instructions in my car’s manual despite the fact that I know this violates the very highest law of The Man Code. So there I was, in the rain, off Highway 28, reading from page 325 of the Toyota Highlander manual how to jump a battery to two men who were half-listening to me. Gesturing wildly for emphasis in an attempt to get their full attention. In my red pajamas. While my kids acted like wild banshees in the backseat. Her car started, the men disconnected the jumper cables without blowing up anything or harming anyone, JavaDad once again successfully executed another illegal three-point turn, and we were on our way home. “That was COOL!” JavaBoy exclaimed. JavaDad grinned slightly. I think he just may remember why he married me after all. The long strand of white Chinese freshwater pearls I wore to her memorial mass/celebration of life are still on the dresser in the front hallway where I tossed them the second I came home. The purple carnations I bought a week before her death because of their bright hue and their lunar name, “Howl at the Moon,” stand at attention in the crystal vase on the console table, cruelly taunting me with their chirpiness. The deep purple manicure I got three weeks ago along with the other TheDCMoms.com bloggers in her honor and in an attempt to brighten her days in bed, finally needed attention. I cried softly as the manicurist took it off, just as I did when she put it on. Three weeks ago, with every stroke of the lacquer on my nails, I knew this would probably be the first, last, and only time I would wear purple nail polish. I knew in my heart time was running out. She fought a valiant fight against what I consider to be a particularly vicious form of cancer — inflammatory breast cancer (“the one without a lump”). So hard, so long, and so well that almost to the end many of us thought she was going to rebound and make it for a while longer. Or as she told me two weeks before the end, that she was just “regrouping.” But there comes a point when you know it is time to say goodbye. I am eternally grateful to both Susan and her family for allowing me the time to do so while she was alive. I must pause to say that I’ve been reminded that Susan did not “lose her battle with cancer.” Susan lived longer than expected, and she lived the heck out of every single day. She kicked cancer up and down and back again. It may have ultimately claimed her life, but cancer won nothing. I have written and deleted this post several times. Should it be a tribute? A summary of a friendship? An accounting of events? Finally, I’ve decided to simply share a story. 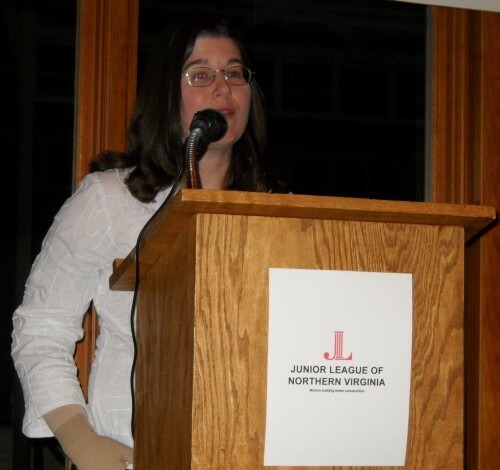 When the Junior League of Northern Virginia was holding a fundraiser to raise money for The Children’s Science Center and put out the call for a Celebrity Scientist, I turned to Susan. Would she be willing to share her story of how museums helped shape her career? Susan, being so Susan, answered that she would be delighted. Sadly, it turned out to be a day when she was in pain. The cancer had returned, she just didn’t know it yet. I had begged her not to come if she was in pain, telling her we’d make do, but she came anyway. Because that was Susan. She’d fight through pain to do a favor for a friend and to do something she thought was important. Without anyone else knowing the pain she was in, she stood behind that podium and shared a story that people still talk about today. Her parents had taken her to a museum in Galveston, TX when she was three years old. 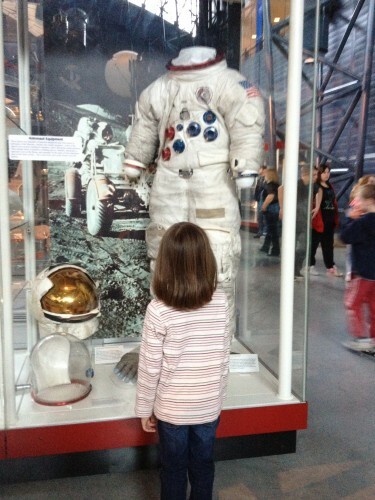 After looking at all the astronaut suits, she looked up at her mother and asked, “Mommy, why aren’t there any GIRL astronauts?” To which her mother replied, “I’m not sure.” At the end of the exhibit, you could write a question on a card and drop it into a box, and Susan decided to ask NASA why girls weren’t astronauts, too. And at the tender age of three, she decided that she was going to grow up and work for NASA. And she did. It was this story I shared with her mother at the visitation, and her mother says she vividly remembered that day. I wanted to share it with her, mother to mother, to let her know just how much that moment in time meant to Susan. Sometimes, as mothers, we forget just how precious those trips to a museum, a library or a zoo can mean. They can literally change a child’s life. Somehow I just wanted to give her mother a piece of her daughter back with that story. A memory of Susan as a little girl. Her father told us, “We taught her how to read at three and then she didn’t need us again!” Oh how, that sounds like Susan. And frankly, like my JavaGirl. I credit Susan’s story with the success of the fundraiser that night. But I also credit it with planting a seed in my mind that though my son is the one who exhibits the most interest in science, that I need to be sure that I take equal time to foster it in my daughter. It’s not that I didn’t know this was important, it’s just that in the hubbub of parenting, it is so easy to lose sight of things. JavaBoy already wants to be a chemist. JavaGirl currently wants to be a horseback rescue rider. JavaBoy sees everything through science-filtered eyes, whereas I have to work at it just a little more with JavaGirl. She enjoys science, it’s just I have to remember to include her because she doesn’t have a single-minded focus like her brother. Mere days after Susan’s funeral, we were at the National Air and Space Museum’s Udvar-Hazy Center in Dulles, where I was proud to see the Museum Without Walls partnership between the Junior League and the Children’s Science Center in action on a Super Science Saturday — kids were trying out mobile exhibits with a glee that I know would’ve brought out Susan’s brilliant smile. The Children’s Science Center is still raising money toward a goal of a future permanent building, but now has traveling exhibits it takes to schools and fairs. From there we walked over to the space exhibit, and I took JavaGirl by the hand to show her an astronaut suit in a glass case and explain to her “Miss Susan’s” story. We walked by an exhibit about exploration on Mars and I said that I knew that Susan was involved with that but that I didn’t know all the details — the kids were pounding me with questions. I was already regretting not having had enough time to ask Susan all the questions I would’ve liked to. When I spoke with Susan about science, it was usually more on the kid level, rather than delving into her career. It had always been my intention to get her together with my kids for a career discussion — she had met them once, but all our kids played while the adults talked — but the timing never worked out. I’m hoping some of Susan’s Women in Planetary Science friends will help me fill in some of the gaps. At the end of a long day, after she was in her pajamas, JavaGirl came into my room and said, “Mommy, before I go to bed, I would like you to talk to me some more about Miss Susan and science.” I fought back my tears — mixed sadness over losing Susan and joy over a little girl’s interest — and we talked some more. We’ve spent the past several days working on the kids’ science fair projects, and I could swear I’ve heard Susan laughing from heaven a few times, like when I called the chemistry department at George Mason to ask a grad student to explain some unexpected results to JavaBoy, or when JavaGirl came up with zillions of questions of her own. I wore my IBC Research pin to the Discover Engineering Family Day both in the hopes it would open up a conversation with someone, and in a way, to “bring” Susan with me to a day I think she would’ve immensely enjoyed. Seeing so many kids enjoying STEM activities, such as building Lego structures and testing them out in a tsunami wave machine. 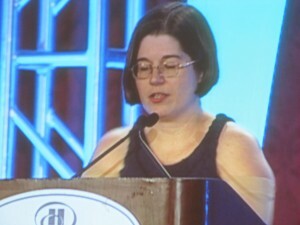 No matter what the specific discipline, Susan encouraged intellectual curiosity in children (and people) of all ages. I just pictured her standing there, with that broad smile on her face, saying, “COOL!” And wouldn’t you know it, the “prize” for completing your passport for visiting several booths was a chance to sit and talk to an astronaut. Susan is gone. But she’s still here. 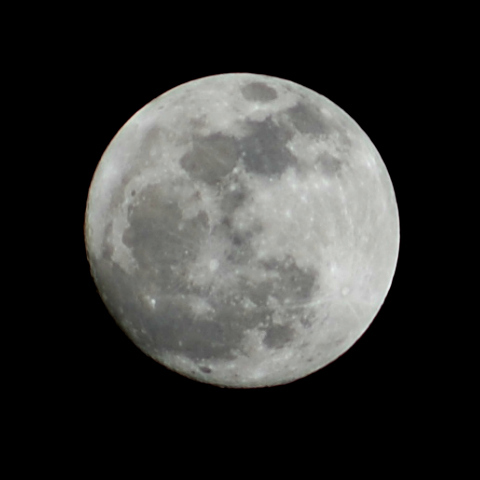 Forever in my heart, my memory, and yes, I believe watching us from above. At times, giggling. Susan, you are an inspiration always, in so many ways. There are many ways I could have been a better friend to you, but know that I could never have asked for a better friend than you. I miss you. I have made a donation in her memory to the Inflammatory Breast Cancer Research Foundation. Please consider doing the same or making a difference to the charity of your choice. Unless otherwise noted, all photos are my own.